I wasn’t really shocked to see another ugly Twitter trending topic about black women emerge Sunday night. #StopBlackGirls2013 isn’t the first time I’ve seen Twitter become a web war zone littered with pieces of black women’s mauled images scattered across its digital battlefield. #StopBlackGirls2013 didn’t surprise me but it did hurt. 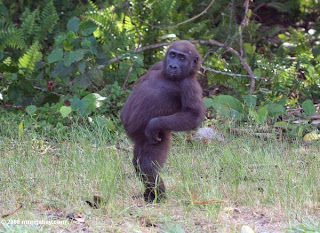 First, there was the photo of a gorilla leaning back with its hands on its hips that made me gasp. Then I saw photos of grown black women’s bodies placed next to animals and objects. Here's a Storify of some of the tweets. But the photos of little black girls were really disturbing. Girls sitting in classrooms, trying on clothes at stores and taking selfies all got sucked into this ugly trending topic. The #StopBlackGirls2013 Twitter trend seemed to attempt to showcase perceived ignorance among black women and girls. But even working at desks in classrooms, acting out the opposite of a stereotype, these black girls couldn’t win. #StopBlackGirls2013 hit me in the gut because I saw it grow so fast and the women and girls seemed so familiar. Some of those women’s bodies look like mine. A few of those little girls’ selfies remind me of pictures my baby cousin takes of herself. #StopBlackGirls2013 reminds me that black women’s bodies aren’t valued and neither are the spirits that reside in them. Historic stereotypes make it easy to reduce us to a funny photo that appears to be meaningless. But there is meaning in these ugly images of black women that are etched in the American psyche and continue to be recycled. Twitter users also sent tweets using #StopWhiteGirls2013, #StopIndianGirls2013 and #StopHispanicGirls2013. Those were also sexist and degrading. People of all backgrounds sent all tweets, including black folks. But #StopBlackGirls2013 had a stronger and longer Twitter life. At 8:30 p.m. I noticed it was the number five trending topic. It was in second place 20 minutes later. #StopWhiteGirls2013 trended more than an hour later at number six but it didn’t stay a top 10 Twitter topic for long. The #StopBlackGirls2013 hashtag is part of America’s historical legacy of objectifying and demeaning black women’s bodies for sport and entertainment. Social media is just a new platform where it happens and the technology allows stereotypes to amplify quickly. Twitter especially often transforms into a cyber combat zone where black women and girls are abruptly ambushed simply for existing. On Twitter black women always seem to be under attack and troops remain armed with an arsenal of stereotypes, memes and hashtags (such as #GhettoBabyNames and #BlackBitches) ready to strike. Remember how Rachel Jeantel was attacked. I felt the sting of the #StopBlackGirls2013 hashtag more because just two days before I presented at the Gender, Race and Representation in Magazines and New Media conference at Cornell University’s Africana Studies and Research Center. The keynote address from Kimberly N. Foster, founder of the online community For Harriet, reminded me of the ways that black women are using digital media to create their own images. Black women and others entered the #StopBlackGirls2013 stream to disrupt the discourse and defend black women. More disruption and reclamation are needed to #StopBlackGirls from being the punchline. thank you for writing this - I had similar thoughts when I saw this hashtag and I'm proud to be a blogger defying the stereotypes. Thank you for writing this. I have a Twitter account and never use it, but my friend sent me the links to some of the postings. I was appalled and very upset. I recently watched '12 Years a Slave' and it seems like as much as we've progressed, we really have not. A lot of the posts are by black people and a lot of the responses of 'lmao' etc are from both caucasian, hispanic, AND black people. IT makes me wonder, does society really value black women at all?